It's perfect upgrade to Falcon Northwest's high-quality custom gaming PCs, the Killer NIC K1 is a high-performance network card designed specifically to improve online gaming performance. Falcon Northwest and Bigfoot Networks have teamed up to bring a killer gaming experience to customers building one of Falcon's best-of-class, award-winning PC systems. Gamers can now order Bigfoot Networks' Killer NIC™ K1 gaming network card as an upgrade option on Falcon Northwest Gaming PCs, including the Mach V, Talon and FragBox systems. Now Falcon Northwest customers can get the competitive edge in their online gaming experience by using the Killer NIC K1 - the only network card that reduces lag and delivers smoother, more responsive online game play. * Features built-in gamer-grade Killer Hardware Firewall & Killer Hardware Bandwidth Control to manage and secure your gaming network with high-performance tools. * reduce lag and latency often experienced in high action interactive MMO and First Person Shooter games. * Killer accelerates your game data for a smoother more responsive online gaming experience and a competitive edge in the sense Faster Game Data and Smoother Gameplay When it Matters Most. * Offloads all network processing from the CPU to boost frame rates, especially during moments of intense action. * Game network packets are prioritized so they get to and from your game faster. Falcon Northwest makes PCs for enthusiasts. It invented the custom Gaming PC concept back in 1992 and has won every major award from just about every PC review outlet. Falcon Northwest offers its customers PC speed, reliability, compatibility and customization. 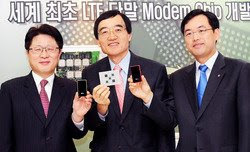 LG Electronics (LG), a worldwide technology and design leader in mobile communications, announced on 10th of this December to indicate that it has independently developed the first handset (user equipment) modem chip based on 3GPP Long Term Evolution (LTE)* technology standards. The modem chip can theoretically support wireless download speeds of 100Mbps (megabits per second) and upload speeds of 50Mbps. This represents a significant step toward creating a market-ready 4G* phone. "Now that LG has developed and tested the first 4G handset modem, a commercially viable LTE handset is on the horizon," said Dr. Woo Hyun Paik, CTO of LG Electronics. "This latest breakthrough gives us a strong technology advantage that we will use to bolster our industry leadership." The Modem Chip is the most crucial component required to create a viable 4G handset with LTE technology, the leading candidate to become the fourth generation mobile phone technology standard to mention here is to qualify as 4G, a network technology must be able to transfer data at over 1 Gbps to a stationary receiver or 100Mbps to a receiver moving at 60 Km/h. This is 50 times faster than WCDMA for moving receivers and 10 times faster than wired broadband internet connections for stationary receivers. 4G networks are also IP-based, making them more efficient. LG demonstrated the chip today at its Mobile Communication Technology Research Lab in Anyang, Korea, achieving wireless download speeds of 60 Mbps and upload speeds of 20 Mbps. The fastest phones currently on the market use HSDPA technology and download at a maximum speed of 7.6 Mbps. Higher download speeds are becoming more and more important as people are increasingly using their mobile phones to watch movies, listen to music and browse the internet. With LTE technology, users can download a 700 MB movie file in less than one minute at speeds of 100 Mbps. LTE technology would also allow consumers to simultaneously stream four HD movies without any buffering. The Modem Chip is the most crucial component required to create a viable 4G handset with LTE technology, the leading candidate to become the fourth generation mobile phone technology standard. 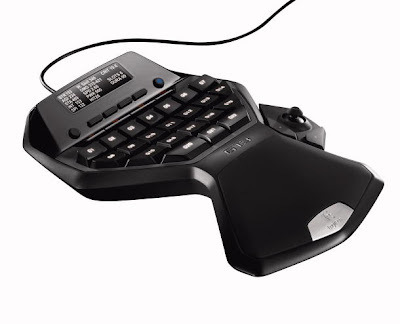 Logitech G13 Advanced PC Gaming Keyboard the new game accessory for PC. G13 gameboard features a powerful built-in LCD screen, 25 programmable keys and onboard memory, helping you take your PC gameplay to the next level. The G13 Advanced Gaming Keyboard has pre-configured settings for many popular games like World of Warcraft - Burning Crusade, Lord of the Rings Online - Shadows of Angmar, Call of Duty 4 - Modern Warfare and more.. In the sense G13 has three game modes, 25 programmable keys, and a programmable analog stick. This allows for over 87 ways to control your game, and even allows for custom button profiles as well as creating macros without having to pause the game. Another prominent feature is the 160 x 43 pixel GamePanel LCD screen gives you a secondary source for useful information from a variety of games and programs to show live game stats, system info, or messages from other players. Aside from the screen, the G13 includes backlighting with several color options, and the ability to save three key profiles on the device itself, handy for swapping it between different PCs. The LiveSpeakR™ is a unique ultra-portable speaker system that fits in your pocket! Invented by 24-year-old Erik Groset and Robin Defay the partnership heads of DGA (Digital Group Audio) a subsidiary of D&G Solutions, LLC. 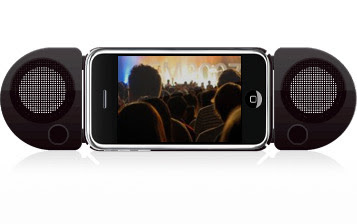 the LiveSpeakR™ (www.livespeakr.com) is a speaker system for the iPhone and iPod Touch unlike any other. 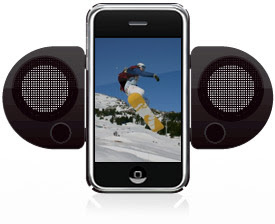 It features a set of speakers that fold-up and store conveniently behind the device for maximum portability. The speakers expand, contract, and rotate to work with both portrait and landscape modes, as well as speaker-phone mode. The LiveSpeakR™ is shielded against radio frequency interference in order to exude maximum sound quality and reduce unnecessary cellular interference eliminating the need to put your phone in "airplane" mode. This amazing new speaker system features a set of speakers that fold-up and store conveniently behind the iPhone when they are not in use allowing for maximum portability. When the unit is stored (or hidden) it piggy-backs on the iPhone or iPod Touch making it portable enough to fit in your pocket for on-the-go multimedia. The unique style of the LiveSpeakR™ is visually stunning featuring bold design inspired by modern art. At launch the product will be available in black or white with more colors to come. LiveSpeakR™ on its competitors has its truly impressive functionality and highly innovative set of features. The system itself is ultra-portable and connects to your media player using a specially made 4-in-1 "Super" cradle that also acts as a protective case. Using an innovative design the cradle can uniquely hold all versions of the iPhone and iPod Touch. The cradle then locks into place on the LiveSpeakR™ and rotates (functioning much like the handling of a Rubik's cube) to interact with both the landscape and portrait positions within the media players. Then simply turn the LiveSpeakR™ on to enjoy the high quality speakers that are shielded against the radio frequency interference which plagues other speaker systems. When the iPhone receives an incoming phone call, the music is automatically fades and the LiveSpeakR™ acts as a speakerphone enhancement, routing the call audio through the speakers and allowing convenient conference call capability. 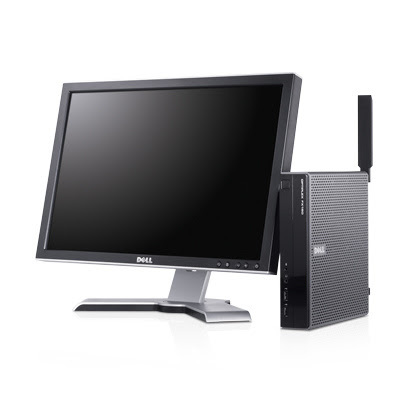 Dell Inc. announced its smallest commercial desktop system ever, the OptiPlex 160. Designed for environments where physical space is at a premium and built with practical technology for general-purpose computing applications, the OptiPlex 160 is designed to deliver energy efficiency and reliability in a space-saving design that maximizes productivity while reducing workspace clutter OptiPlex desktops are among the most eco-friendly business desktops available worldwide, with power management features to help you consume less energy and save on IT costs. “With today’s release of the 160, we are rounding out a complete refresh of OptiPlex products from the world’s top seller of business desktops. * The OptiPlex 160 adds yet another low-profile, entry-level option to our diverse portfolio of enterprise solutions, delivering essential performance for common office applications,” said Darrel Ward, director, Dell Product Group. Like all of Dell’s OptiPlex desktops, the 160 comes with a long, managed lifecycle and the support of Dell systems management solutions such as the Dell Client Manager console. All OptiPlex desktops feature optional customizable Dell Services such as ProSupport, extended limited warranties, Custom Factory Integration, Installation and Deployment Services and many more. Global Souring UK Ltd, Releases the New Tritton AXPRO 5.1 Dolby Digital Surround Gaming Headset into the UK Market. 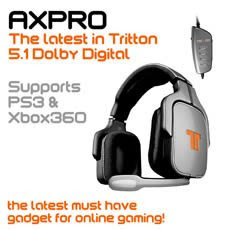 The headset is compatible with all major gaming systems and AXPRO 5.1 Dolby Digital Surround Gaming Headset supports audio and voice communication for all major gaming systems including Xbox 360, PlayStation 3, PlayStation 2, PC, and any other devices with optical out connections. "The AX Pro is by far the most versatile gaming headset on the market, helping players of any level to fully immerse themselves in their gaming experience," said Christopher Von Huben (president- Tritton Technologies) "New games are constantly being developed with ultra-advanced audio features such as Dolby Digital surround sound and the AXPRO enables players to completely integrate the game's audio elements, as well as tune out exterior distractions. For the competitive gamers, the AX Pro provides a real competitive edge as they can hear every audio detail from every direction in a game." The headset is Dolby Digital, Pro logic-certified and uses four drivers in each ear cup to give gamers a three-dimensional audio surround sound experience. Beyond the impressive driver-to-ear ratio, the AXPRO comes with an in-line independent volume control for voice chat. With the headset supporting audio and voice communication for all major systems, players can rely on the AXPRO alone, no matter the console that they choose to use it on. The AXPRO is now available from www.cooleststuff.co.uk and through Tritton's exclusive UK wholesale distributor: Global Sourcing UK Ltd.
Walmart.com is helping moms everywhere be the hero this Christmas by making tens of thousands of Nintendo Wii consoles, one of the the hottest selling gifts this season, available for purchase from 8th of December on online at walmart.com and only still supplies last. 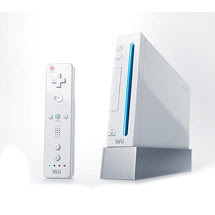 Walmart.com will offer Nintendo Wii consoles for Price of $249.24, two Wii games for $30 and accessories starting under $10. Customers who have been looking for the hard-to-find Nintendo Wii now have an opportunity to purchase the top selling video game console at a great value. "We're thrilled to be able to provide more customers the opportunity to experience and enjoy the Nintendo Wii this Christmas," said Kelly Thompson, Walmart.com chief merchant. "Based on the success we've seen with Wii Fit and Nintendo Wii, customers recognize that Walmart.com is the online destination for the strongest values and best selection in video games this season." Wal-Mart Stores, Inc. operates Wal-Mart discount stores, Supercenters, Neighborhood Markets and Sam's Club locations in the United States. The Company operates in Argentina, Brazil, Canada, China, Costa Rica, El Salvador, Guatemala, Honduras, Japan, Mexico, Nicaragua, Puerto Rico and the United Kingdom. The Company's securities are listed on the New York Stock Exchange under the symbol WMT.